The quote above comes from the article Preparing Students To Produce Digital Content by Joseph Sanfilippo. Although it was written in 2015, I find the 6 points to consider when preparing your students to create digital content still very much relevant. When students create content they become owners of the learning, yet in a world where they are surrounded by digital content and rich media, it may be more engaging and motivating for them to create projects that are digital where the possibilities are endless. The digital make up of the content means that it can be shared to a global and more authentic audience. Content becomes meaningful and purposeful. Students can seek and receive feedback from a significantly wider audience, peers, teachers, parents and even experts in the field. When students are creating content, they are forced to higher order thinking. Dr. Ruben Puentedura, defines the levels of technology integration as Substitution, Augmentation, Modification and Redefinition or as many of you know it, the SAMR ladder. Content creation using technology will rarely fall under Substitution. 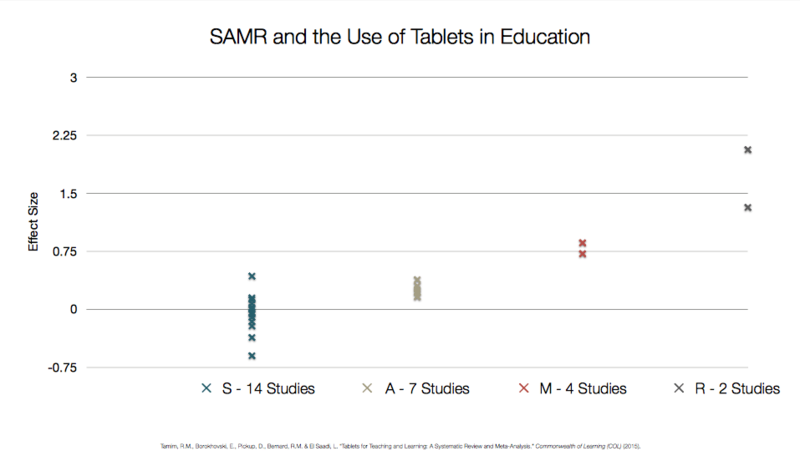 An analysis of multiple credible studies looking the use of technology by students and the associated impact on learning when referenced against the SAMR ladder can be seen below. It is fascinating to see the magnitude of the effect, in favour of learning, when tasks assigned to students involved modification and redefinition. Even when tasks are at the augmentation level, there is no negative impact on student learning. Only when the task is at the substitution level is there an opportunity for that task to have an overall negative effect on student learning. Essentially, this is suggesting that when we are concerned about the use of technology and the associated distractions, we need to ask ourselves – where does this task sit on the SAMR ladder? It is a known fact that when students are engaged, they learn better and develop a deeper and more meaningful understanding. If we consider the SAMR model, I would imagine we would also see a direct correlation between engagement and the associated position on the SAMR ladder the particular task holds. Substitution, less engaged, more distracted. Modification and redefinition, more engaged, less distracted. 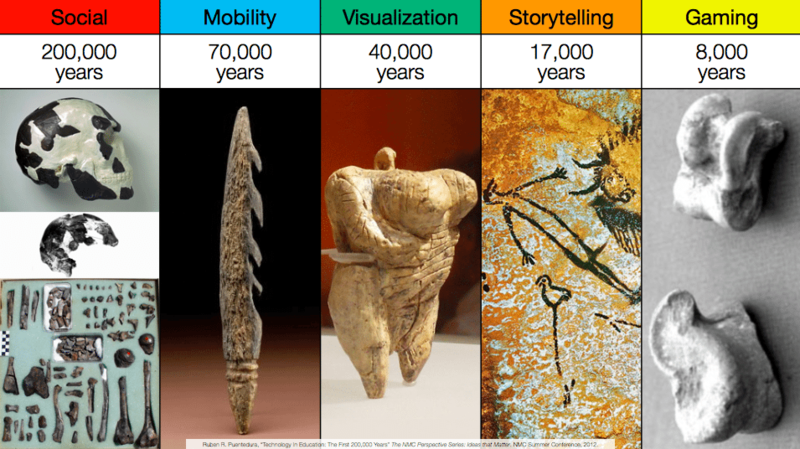 Dr. Puentedura provides a table listing the practices associated with the fundamental domains of human activity; social, mobility, visualisation, story telling, and gaming. The ideal is to incorporate between 2 and 4 of these practices into any one learning task. Social: To encourage collaboration, communication and sharing, think blogging, online discussions, microblogging with apps like Twitter, wikis and RSS feeds. Mobility: Anytime, anywhere learning and creation is facilitated by so many facets of technology integration. Consider the use of mobile tools such as sensors, cameras, cloud resources not to mention the numerous apps referred to in this post! Visualisation: Make abstract concepts tangible using apps like Comic Life for graphic story telling, Inspiration and Popplet for graphic organisers, Google Earth, VR Expeditions, Word Collage and 3D Timeline are excellent for this purpose. Storytelling: There are so many options here. Comic Life and Book Creator for sequential art and narrative transitions, iMovie, Apple Clips, Explain Everything Video Scribe and Adobe Spark for moving images and Prezi and ThinkLink for interactive media. Gaming: Feedback loops and formative assessment can be facilitated through the use of apps like Stick Around, Kahoot, Socrative, and Mind Craft. The use of blogs in the classroom enables a variety of tasks to reach both modification and redefinition on the SAMR ladder. It also supports associated practices: Social, Mobility and Storytelling.